My stepmother’s eyes bulging with anger, my father’s lips pressed into a flat line: this was what I held the laminated menu in front of my face for. So I couldn’t see them. See or be seen. Behind creamed corn and baked beans and meatloaf with gravy, I might be safe. The old guy reading the newspaper at the cash register turned to look. It was late, even the traffic on the highway outside had slowed to a drip and we were the restaurant’s only customers, the only things breaking the routine. Some quiets are soft but some are heavy as boulders and the mood at our table was as oppressive and inescapable as a swollen bladder. A waitress in a calico apron came to take our order but by the time she came back with our plates, my parents had taken their brawl out to the parking lot. “Don’t worry. I’m in no rush.” She put the plates down and wiped her hands on her apron. Her smile stretched her face like a well-worn wrinkle. “That’s right, put your napkin in your lap,” she told me. “At least somebody taught you some manners.” When she joined the man at the register, I sat up straight and chewed carefully while they whispered, but I couldn’t hear a word over the angry shrieks exploding like fireworks in the parking lot. I concentrated on the plate in front of me. After awhile, the place was quiet again. The florescent light grew thinner. Near the counter, a tower of pies rotated quietly in a glass case. The waitress wandered back to remind me to eat my vegetables and then stood there to make sure I did. The green beans tasted rusty but I ate every one. She brought plates to cover my parents’ dishes and after she cleared mine, I hid a spill under my napkin and played with a straw. There was no clock, only the carousel of pies spinning clockwise. The neon signs on the wall behind me hummed. I was resting my head on my arm when the old man cleared this throat. “I thought you might like to try this.” He placed a wooden triangle studded with pegs on the table in front of me. He had dark shadows hollowing his sallow face. 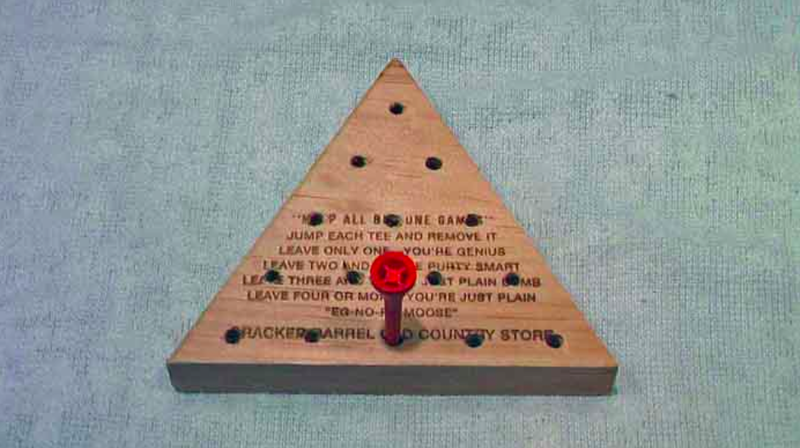 I told him I’d never seen “The Original IQ Tester” before so he explained the rules: There are 15 holes and 14 pegs. Every time you jump one peg with another, the jumped peg gets removed. I kept trying. The room got quieter. The pies performed their relentless evolutions and the windows revealed nothing but a dark so solid it turned the glass into a mirror reflecting the flypaper strips and cash register and vinyl wainscoting back to us, sealing us inside a time capsule of fulvous light. A driver on the highway might not even see us. A passenger might blink and sail right by without noticing. His face was as stiff as if he’d been whittled in balsa wood. Without saying a word, with only his long fingers he showed me the secret combination. There was only one way to solve the puzzle, one path to memorize, but I learned fast and soon I could do it in less than a minute. “What do you mean he?” She asked him.“She’s a girl, not a boy.” And she told me to take off my hat to show him. I didn’t want to. If I left the hat on I could be a boy and I could stay in that secret stillness forever, but I did what I was told. I pulled off my cap. “See? I told you so,” she razzed him. “You were fooled by a hat.” The old man’s face didn’t change but I could tell that in fact, everything had changed. Maybe I fell asleep because the next thing I remember, the sun was coming up and I was in the back seat of our car. I still had my hat on but the triangular board game was gone. The back of my father’s head was fixed on the vanishing point and my stepmother’s was turned to the side where the landscape blurred by. I turned my head, too, and tried to see it. I just slapped this title on last minute and I’m not sure if it fits. Maybe “IQ Test” would be better. Maybe just “Roadside.” Maybe “Girl in the Hat” or “Solitaire” or “Insert Title Here.” Why are titles so hard? Are you good at titles? How do you do it? What’s your secret? I love the title — and the story. The title is mysterious and inviting. Does it refer to the argument in the parking lot? The IQ tester? The girl herself? Yes. I enjoy your posts a great deal, thanks for sharing your stories. Thank you, Mary. I find titles difficult. So much meaning packed into so few words. Sometimes titles come right way, sometimes they are the hardest part of a story. I sometimes look for some fragment within the story that hints at a revelation. Whatever you decide it’s a nice story. For me, the title is usually the last thing I write. I keep believing the Writing Fairy will swoop down and fix it for me some day. Title and story are perfect. 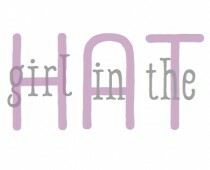 You got me at the beginning with this line: “Some quiets are soft but some are heavy as steel and the mood at our table was as inescapable as a swollen bladder.” I like the “Girl in the Hat” title, because isn’t that who you are? Really lovely! See you soon, Anna. Blair! Maybe I finally wrote my titular story. Two hours ago I tried beef wrapped in cabbage (Saul’s) (it was goood). See you soon! I think the title lends a mysterious air to the post along with the picture it definitely drew me in. I think it’s fitting. Titles don’t always have to sum up a work though, just to hint at enough to draw in your reader and hold them still long enough for you to hook them. You’re right. Especially for stories (as opposed to essays), the title should be more subtle. Thank you for reading! My god “this is good! “Some quiets are soft but some are heavy as boulders” is just one of the phrases that left me breathless. I’m terrible at titles but I really think this piece screams for Girl in the Hat. And, I doff my hat to you, Girl! What an interesting shift, boy to girl, and all because of a hat. I think rangewriter is right about the title. I miss that about childhood– the absence (or needlessness) of gender. I suppose it will happen again when I’m a bit older, though. I really like this story, mainly because of the atmosphere you created. The thin florescent light, darkness turning the glass to a mirror, silent rotation of the pies, and the weighty silence too. I could feel the isolation of the kid trapped in a world she couldn’t control. The title works ok. GIH maybe, but this story doesn’t really seem to be about the boy to girl revelation. It seems to be about loneliness and powerlessness. So for me that points to Solitaire. I don’t care much for titles that are too tricky or witty. I’d rather have just a plain old title that evokes the essence of the story. Maybe something like Table for one… A slice of pie… Cold plates… Every last bean.. or Solitaire, that’s good. I remember, in our town at that time, we thought kids whose parents weren’t divorced were kind of out of style… uncool. My parents used to fight like that every night at the dinner table before they blew apart. Maybe it was too much self actualization, discovery, options, affluence. Times seem so different now. Maybe it’s a reaction to those memories, or a more acute sense of what’s valuable, but I wouldn’t trade the happiness of our family for any idea, urge or trinket found on this planet. Glad your a writer… we need you. Well you’re right, Todd– the story has two points, which may be one too many for a story this short, but still, solitaire is the main point. We definitely seem to have different ideas about intimacy these days. I really, really like being alone but I also love being together. I want both. Is that possible? Your title has multiple layers, as always. Of course, this made me think of ‘boy in the hat’, but there is a lot more to it than that 🙂 Sometimes titles come first for me, sometimes last. But I always know the writing is on its way when I find one. What a beautiful story of the painful helplessness. I’d hide in my room, hands over my ears, crying…. but never, ever remember my parents fighting in public. Brenda brought me here, and I already feel like I’m swimming in a lusciously warm pool. I cannot wait to read more of your stories. Pleasure and pain, together – that’s the very stuff of life. Lovely story, I think the Title was perfect! superb, Girl in the Hat sounds perfect!